So evidently, when LA Mayoral candidate Eric Garcetti isn't running around trying to get elected, he's rescuing semi-conscious pedestrians with bleeding head wounds. As seen on Facebook, Silverlake resident, Chris Cruse, posted about his encounter last night with Garcetti. The nicest thing just happened. I walked down my street to pick up some food, and came across a young guy laying on the sidewalk. His friend was yelling at him, slapping his face to wake up. The guy on the ground had a big gash and was bleeding out of his head. Not moving. I asked his friend if he was ok, but it was clear he needed help. Right then, a black car pulled up on Silver Lake Blvd and a handsome businessman-looking guy rolled down the window. Asked if everything was ok. I told him this guy hit his head real bad. The car pulled over and 2 guys got out. They seemed to know exactly what to do. One brought a shirt and rolled it up and stuck it under the guy's head. Asked a bunch of questions. The other called the paramedics. The friend was worried that they'd be in trouble, and asked us to just leave them there. The handsome one said they work for the city, they can't just leave someone hurt on the ground. He hit his head, he needs to be checked out. The friend nodded ok.
Once the paramedics got there, they got the kid up and on a stretcher and into the ambulance. Seemed like he was in good hands. I was in awe that these two guys came in and handled this whole situation so quickly and solidly. As they headed back to the car, I stopped them and asked, "You said you work for the city, what's your name?" I wanted to know what city employee was being a civil servant and Good Samaritan even on a Saturday night. The guy shook my hand and said, "Eric Garcetti." Garcetti's campaign is confirming this morning that the incident took place pretty much as Cruse describes it. In a brief email conversation I had with Cruse about his post, he added a few more details. The guys were a little drunk, and apparently (the victim) tripped. The gash was on the front of his head / forehead and it was gnarly. The firemen took him away in a stretcher with a neck brace, but said they were just taking precautions. They thought he would be ok. Going to check for concussion, etc. I guess I was just touched that (Garcetti) helped, and I wouldn't have known it was him unless I had asked. I told everyone at Gingergrass, where I was walking to pick up food when this all happened, they were like "whoa"
LA Streetsblog picked up on another aspect of the story we missed. Garcetti didn't tell anyone about the incident afterwards, not even his own campaign staff. They found out the same way we did, when Cruse wrote about the incident on his Facebook wall. This isn’t just a nice story, to Garcetti’s credit he didn’t try to take advantage of the situation for campaign purposes. Cruse is no politico, and the Garcetti team didn’t seem to know what I was talking about at first, before confirming the event did happen. Councilwoman Ruth Galanter Files Ethic Complaint Against Wendy Greuel, Calls Conduct "Illegal" And An "Insult To Voters"
Former LA Councilwoman Ruth Galanter filed a formal ethics complaint today against LA City Controller and Mayoral candidate Wendy Greuel, calling the candidate's reported use of city resources for her campaign "illegal" and an "insult to voters". Citing revelations by the Los Cerritos Community News that they had obtained 130 pages of emails showing the Controller using her official city email address to repeatedly communicate with campaign operatives during normal business hours, Galanter filed a complaint with the LA City Ethics Commission saying the number and frequency of the emails showed a clear pattern of deliberate and illegal use of resources. “Ms. Greuel’s misuse of public resources is an insult to the voters and taxpayers of Los Angeles made even more egregious by the fact that we taxpayers are paying her approximately $200,000 a year, plus a free car and cellphone, to prevent just such misuse", Galanter said. Yesterday, the Los Cerritos Community News released all 130 pages they obtained through a FOIA request (see below). Greuel's office took 90 days to respond to the request, far longer than the 24 days dictated by law, and provided far fewer than the "tens of thousands of documents" Greuel's office initially claimed were covered in LCCN's request. Eric Garcetti's campaign has yet to respond to the controversy. But Rick Jacobs, founder of a political action committee to support Garcetti, called on a special investigator to release all documents from Greuel's office pertaining to her mayoral campaign. "Wendy Greuel wants the voter's trust to become Mayor of our city, but she's violated that trust repeatedly by spending taxpayer's dollars on her campaign," said Jacobs. An investigation from the LA Ethics Commission of these issues will likely take months, stretching well past Election Day. Regardless of their findings the damage may already be done. 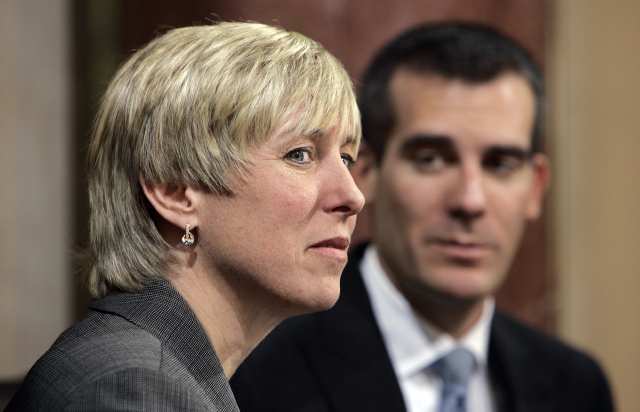 During the campaign, Greuel has tried to portray herself as the best candidate to root out "waste, fraud and abuse" in City Hall, and in recent days stepped up her attacks against opponent Eric Garcetti, attempting to tie him to developer Juri Ripinksy, a convicted felon, and also claiming Garcetti had taken "illegal" votes on a Clear Channel billboard settlement. It's unclear how much traction these claims will have once LCCN's allegations are more widely known. The LA City Council is about to vote on whether to move LAX's north runways and potentially shut down Lincoln Blvd. 2-5 years for construction. They need to hear from us the day of the vote. Numbers matter, so we're asking you to come downtown on the 30th to submit your comments in person. 200 N. Spring Street (click here for directions) You must enter City Hall from the Main Street entrance. Security will direct you to Council Chambers on the 3rd floor. Allow at least 15 minutes to get inside the building. By car: The closest pay lot is at 225 N. Los Angeles St. at the LA Mall (click here for directions). Cost is $16. Exiting the Public Parking area, you will end up at the 'Food Court'. Go up to street level to get to the Main Street City Hall entrance. By carpool: We are organizing a bus to take speakers downtown. If you are interested in this option, go to this link to RSVP. You must RSVP by Sunday. Cost is $15 cash and will be collected before you get on the bus. We leave from Councilman Rosendahl's Westchester office at 7166 West Manchester Ave (click on this link for directions )at 8:30am and will return around 2pm, depending on the length of the hearing. We know of several Councilmembers who are on the fence about runway expansion. We need you to call their office ASAP. Tell them to vote NO on runway expansion and YES on modernization, as well as asking them to support Alternatives 2 and 9. That's all you need to say. It's OK to call them even if you don't live in the City of LA, but if you are a constituent of any of these councilmembers be sure to tell them that. Over a thousand of you have signed our petition. We need your help to get the word out about the April 30th vote and about our petition so we can keep the momentum going! Please forward the link www.stopendlesscarmageddon.com to your friends, relatives and neighbors. Every signature triggers an email to the Council members voting on Tuesday. Ask them to tell our elected officials we want to make LAX a world-class airport without moving runways, shutting down our streets and causing Endless Carmageddon. LA City Controller Wendy Greuel's mayoral campaign came under scrutiny this afternoon after a Cerritos newspaper published emails showing the Controller soliciting campaign contributions, discussing endorsements and communicating with campaign staff during office hours using her official lacity.org email address, in apparent violation of Los Angeles' Ethics laws. In January, the Los Cerritos Community News sent a public records request to Greuel's office asking for any emails between Greuel's office and campaign managers John Shallman and Rose Kapolczynski, as well as emails from Brian D’Arcy, the head of IBEW Local 18, whose SuperPAC, Working Californians, has spent millions in support of Greuel's mayoral campaign. According to LCCN, Greuel's office initially balked at the records request saying it "was voluminous and encompasses tens of thousands of pages", but relented after the newspaper sent a letter on April 12th threatening to file a lawsuit. In the end, LCCN received only 130 pages of material, including dozens of emails sent to and from various campaign staff and contributors using Greuel's official governmental email address during normal business hours. using City facilities, equipment, supplies or other City resources. 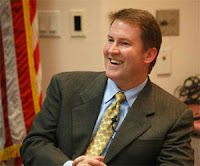 Greuel campaign spokeswoman Laura Wilkinson characterized the email exchanges using Greuel's governmental email address as "inadvertent". "As Controller and as a candidate for Mayor, Wendy Greuel has worked 18-hour days for quite some time. She inadvertently forwarded a few emails when using her personal iPad or iPhone and most of the emails were for scheduling purposes or as an FYI including documents that were scheduled for public release," Wilkinson said in a written statement. However, the emails, which you can read below, include numerous conversations between a Who's Who of political players in Los Angeles, Greuel's campaign staff, campaign contributors and the staff of the Controller's office discussing a variety of topics - from scheduling issues to campaign contributions to Councilman Bill Rosendahl's endorsement. Most of the published emails include time stamps that place them within normal business hours. 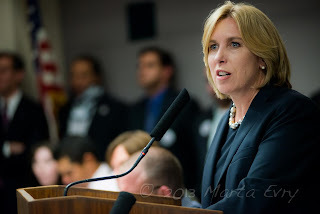 And in one case, Greuel may have violated yet another statute prohibiting the sharing of confidential information acquired in the course of her official duties when she forwarded a Preliminary Financial Report her office prepared for fiscal year 2011-2012 to her campaign staff two and a half hours before giving the document to Mayor Villaraigosa, the City Council and the City Clerk. 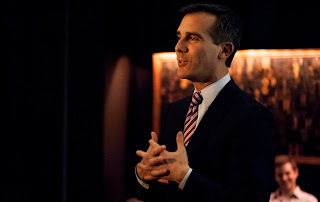 During the campaign, Greuel has tried to portray herself as the best candidate to root out "waste, fraud and abuse" in City Hall, and in recent days stepped up her attacks against opponent Eric Garcetti, attempting to tie him to developer Juri Ripinksy, a convicted felon, and also claiming Garcetti had taken "illegal" votes on a Clear Channel billboard settlement. It's unclear how much traction these claims will have once LCCN's allegations are more widely known. A poll released by the LA Times on Sunday showed Garcetti leading Greuel by 10 points. In her harshest attack yet, Wendy Greuel launched a TV ad this morning claiming opponent Eric Garcetti took an "illegal vote" when he approved a settlement that allowed Clear Channel Communications to convert hundreds of billboards to a digital format. Going by the graphics in the ad, Greuel apparently is basing her attacks on this February 21 LA Times article about an ethics complaint filed by then-mayoral candidate Emanuel Pleitez. Los Angeles mayoral candidate Emanuel Pleitez lodged a complaint with the Ethics Commission this week alleging his opponent, Eric Garcetti, had a financial conflict of interest when he signed off on a lucrative deal with a billboard company. Garcetti, a city councilman, voted in 2006 for a legal settlement that allowed Clear Channel Outdoor to convert hundreds of billboards to a digital format. At the same time, he held stock in Clear Channel Communications, the billboard company's parent. On financial disclosure forms, he had checked a box valuing the stock at between $2,000 and $10,000. Garcetti gave the shares to charity in 2007. Greuel also voted in favor of the billboard settlement. However, nothing in the article alleges that the vote Garcetti took was "illegal", and in fact goes on to list a conflict Greuel herself had regarding another vote taken around the same time. The Times reported last week that City Controller Wendy Greuel pushed for the council to block (a) Home Depot project yet did not publicly discuss that she had inherited a 50% share in a potential competitor, a family building supply business nine miles away. A Greuel spokeswoman said last week that there was no conflict because other Home Depots were near her family's business. Under state law, regulators determine a conflict of interest after reviewing a variety of factors, including the size of the elected official's investment and the amount of revenue generated by the vote. Experts contend the council's vote on Clear Channel generated hundreds of millions of dollars for the company. That surpasses any threshold used by state regulators to establish a conflict of interest. LAX Admits Asking LA City Council To Vote On Runway Expansion "Sight Unseen" In New Memo. It's not surprising that after a week of bad publicity and nearly a thousand signatures from Angelenos calling on the LA City Council to oppose runway expansion, that the multi-billion dollar interests at LAX are pushing back against reports that runway expansion will cause long term closures at Lincoln and Sepulveda. What is surprising, however, is what they've inadvertently admitted to in the process. In a memo prepared for LAX Lobbyist Deigo Alvarez by the global consulting firm CDM Smith and released to the press, officials attempt to make the case that "there is no reasonable basis to believe this type of project would require the 'complete closure' of the existing roadway (Lincoln Blvd)"
What do they base this assessment on? Calling realignment of Lincoln Blvd. "conceptual in nature", the memo admits CDM Smith makes their assertions on speculation alone, since "construction plans and a construction phasing program for the realignment of Lincoln Boulevard have not yet been prepared". Let that sink in for a moment.......LAX officials just admitted they are asking the LA City Council to sign off on a $500 million dollar project quite literally sight unseen, without a single blue-print being drawn up. 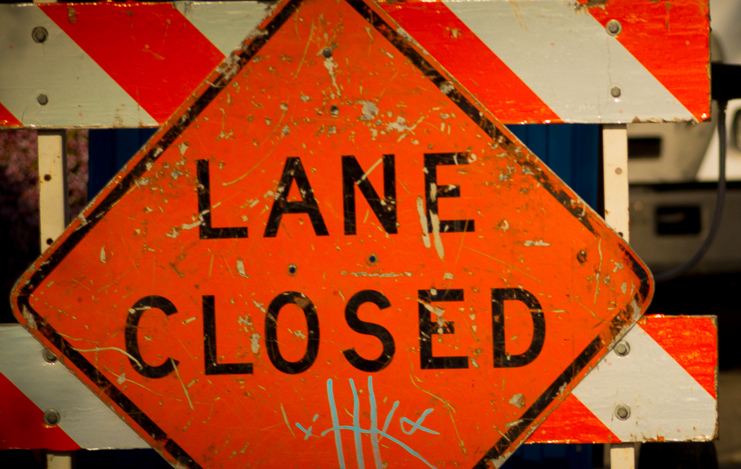 "Partial lane closures would be required to connect the new roadway with the existing lanes at the north and south endpoints, but northbound and southbound travel would continue to be provided on Lincoln Boulevard during this phase." Pay attention to that language, because even when coming up with favorable arguments drawn from thin air, LAX officials still have to admit that moving the the north runways means lane closures. But what LAX is hoping to do is argue that runway expansion won't result in any significant traffic impacts because it wouldn't result in "complete closure" (their words) of Lincoln Blvd. Really? Let's take a look what even partial closures do to major roadways in this city. 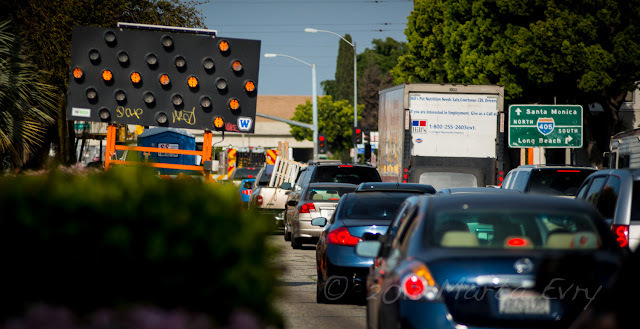 This is what closing a single lane at Venice Blvd and Sepulveda does to traffic. This is what closing two lanes at Venice Blvd. and Robertson Blvd. for Expo Line construction does to traffic. This is what a stalled car blocking one lane on Melrose Ave. does to traffic. This is what only putting up construction signs and threatening to close a lane does to traffic on the 405 at the 10. Pictures, as they say, are worth a thousand words. Even weasel words from LAX Lobbyists. 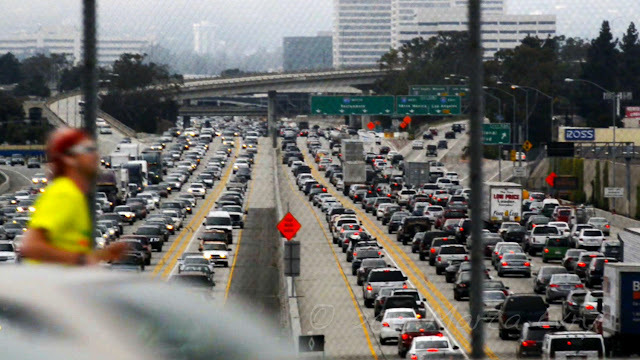 LA City Council Just Voted To Screw Up Traffic Even Worse. Now What? 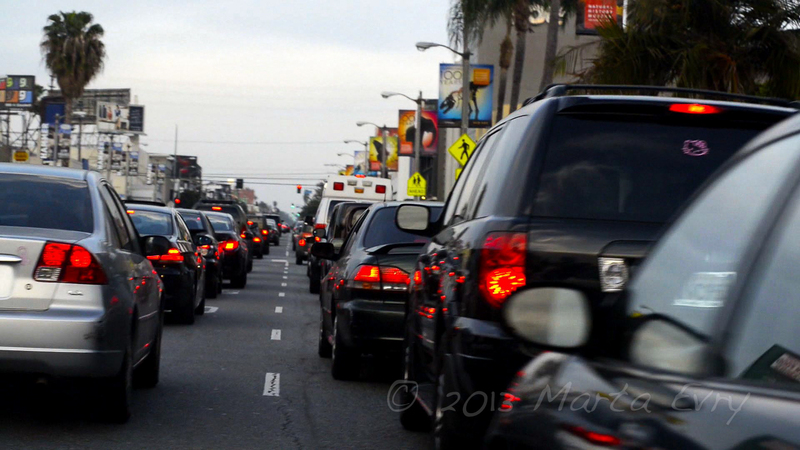 Stop Endless LAX Carmageddon from Marta Evry on Vimeo. Last Wednesday, a special joint committee of the LA City Council voted to side with special interests and expand Los Angeles International Airport's runways, shutting down Lincoln Blvd for years of construction work. But we still have one more shot at this. On Wednesday, April 24th the full City Council votes on the proposal to move LAX's North runways 260 feet and shut down Lincoln Blvd. for construction. So here's what we need you to do, right now. If you haven't signed our petition, do it right now. Sign the petition. Tell our elected officials we want to make LAX a world-class airport without moving runways, shutting down our streets and causing Endless Carmageddon. Every signature triggers an email that will go directly to the Council members. The more signatures we get, the more emails they'll get. Forward this email to your friends and neighbors, right now. Ask them to imagine the Carmageddon-like congestion that would ripple all throughout Los Angeles if Lincoln Blvd. is shut down for construction. Ask them to imagine adding an hour to their daily commute. Now ask them to imagine that going on every day for years. Make no mistake, LAX needs to be modernized. That's why we support a plan already on the table to upgrade the airport terminals, finally bring the Green Line to all the way into the airport, and add more air traffic controllers and much-needed safety features to the existing runways. But with a price tag of over $500 million just to move the runways, the plan being pushed by the Chamber of Commerce and the special interests running LAX makes no sense: there is no justification in terms of safety, efficiency, job creation or environmental benefits. Worse, it could cause lengthy construction disruptions to this vital north/south transportation corridor, resulting in constant gridlock across the region for years to come. .......and made a video together to stop a runway from being moved 260 feet at Los Angeles International Airport. A couple of weeks ago, I reported that Congresswoman Maxine Waters declared war on Henry Waxman after he went behind her back to support a plan being pushed by an "unholy alliance" of the LA Chamber of Commerce and Big Labor to expand LAX's north runways. Well today I get to break the news that Kevin James, the Republican attorney who just ran for Mayor of Los Angeles, agrees with Congresswoman Waters, and is calling for the LA City Council to reject a scheme to move those runways and reroute parts of Lincoln and Sepulveda Blvds to accommodate years of construction. You see, when I realized how badly this plan would screw up traffic for everyone - not just the folks who lived by the airport - I decided to make a video that would lay out exactly what was stake here. Take a minute and have a look......I'll wait. Kevin James agreed to appear in the video right along side Maxine Waters, Bill Rosendahl, Mike Bonin and a bunch of other community leaders who all have one thing in common - they know how Angeleno's quality of life will go down hill if those runways move and Lincoln Blvd. closes. Look, most Angelenos don't know it's going to affect them if the Council approves moving the runways. Until a couple of weeks ago, I know I didn't. And the special interests that control LAX have done a great job painting the activists as anti-growth, anti-modernization NIMBYS. My hope is that between this video and a lot of grassroots activism we can educate people and change that narrative. "Maybe I've looked at this issue closer than others because I was a candidate for mayor and I've spent a lot of time in different communities all across the city, but I can tell you this is not at all a NIMBY issue," Kevin James told me. "I don't live near the airport. I live in Laurel Canyon right near the San Fernando Valley and this is something that concerns me for the whole city.... We need to proceed very carefully here." The LA City Council could vote to move the runways as early as this week, so I'm going to ask you to do three things. 2) Sign the petition. Tell our elected officials we want to make LAX a world-class airport without moving runways, shutting down our streets and causing Endless Carmageddon. 3) Tell a friend - Share the petition on Facebook and Twitter. Will LA Mayoral Candidate's Sharp Divergence On LAX Expansion Provide Clarity For Voters? For voters looking to differentiate between the two candidates vying to be Los Angeles' next mayor, Eric Garcetti's surprise announcement against LAX airport expansion may prove to be a significant factor, especially for voters on the West Side. Los Angeles mayoral candidate Eric Garcetti came out Monday against a plan to move the northernmost runway at Los Angeles International Airport, putting him in line with neighborhood activists near LAX and at odds with one of the city's biggest business groups. Garcetti said he supports an array of LAX construction projects favored by airport officials, including new terminal space and an "automated people mover" to transport passengers to a light rail station. But the city councilman plans to vote against pushing the runway 260 feet closer to homes in Westchester and Playa del Rey, according to campaign spokesman Jeff Millman. The $652-million runway proposal is supported by the Coalition to Fix LAX Now, a group that includes the Los Angeles Area Chamber of Commerce and the powerful Los Angeles County Federation of Labor. 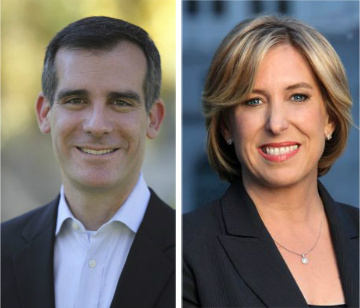 Both have endorsed City Controller Wendy Greuel, Garcetti's opponent in the May 21 runoff election. The LAX proposals are expected to reach the council later this year. In a statement, Millman called the roughly $4-billion package of airport projects favored by Garcetti "the environmentally superior option." It excludes the runway shift and a plan to realign Lincoln Boulevard near LAX, both of which were recommended by airport officials. At KNBC-TV's mayoral debate in January, Wendy Greuel was unequivocal in her support of moving the North runway 260 feet closer to Westchester homes. But according to the Times, yesterday Greuel was less specific about where she stood on LAX expansion. Greuel's spokeswoman Shannon Murphy stated that "Wendy believes we need to move forward in making LAX more competitive and safe and she believes the residents who make the area around LAX their home deserve to be heard." On February 4th, the LA Weekly reported Greuel had tried to privately walk back the remarks she made at the televised debate, but anti-expansion activists were unmoved by her assurances. "We're not buying anything that doesn't say, 'Don't move the runway,'" said Denny Schneider, President of ARSAC (Alliance for a Regional Solution to Airport Congestion). "And it must be a public statement, not just a private one. The other statement was certainly made in public. To give us private assurances is not enough."